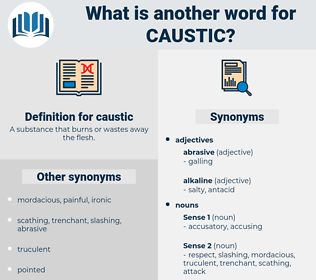 What is another word for caustic? A substance that burns or wastes away the flesh. 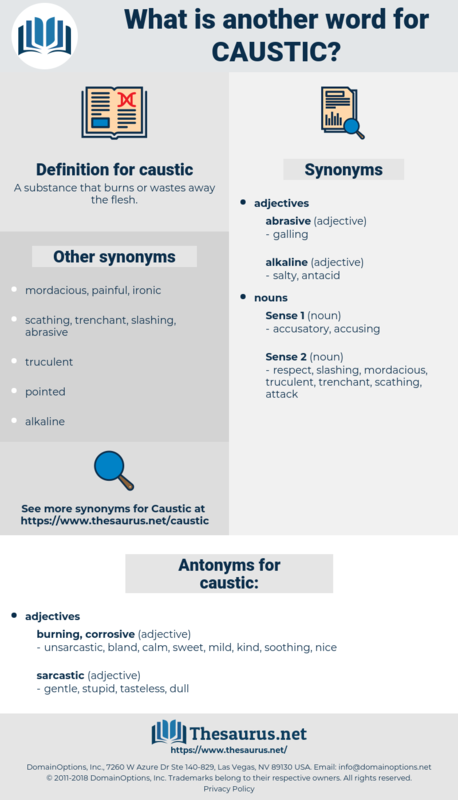 unsarcastic, bland, calm, sweet, mild, kind, soothing, nice. smooth, diplomatic, hospitable, playful, luscious, cordial, polite, sociable, good-natured, gracious, droll, dulcet, merry, good-humored, honeyed, suave, affable, sportive, Nectared, waggish, amusing, urbane, constructive, saccharine, genial. Pizarro is not only independent, but occasionally caustic in his condemnation of those under whom he acted. He knew his father, and perceived that these preliminary and caustic openings of his were really olive branches.